With perfect divine timing, God intervened with a tick and saved me and my new baby Angelina born February 1, 2013. We spent many of our summer weekends having picnics and long walks in the park trails- Samuel, Rose and I. My ipod was filled with countless scenic pictures of tall forests and peaceful lakes and we had even become familiar with a duck family that lingered by the pond. Some afternoons were spent watching the schools of tiny fish in the murky water. We were successful in catching one tiny silver colored fish with a butterfly net. We were going to bring it home to live in our sea monkey tank but changed our minds- for the sake of the sea monkeys which would surely be consumed by the fish, and also for the fish who would be doomed to a life of solitude in a small container. I was completely oblivious to the unwelcomed souvenir that I brought back with me one Sunday afternoon. In fact I had not noticed it until it was well over 24 hours later on my commute home from work the following Monday. Driving home I noticed a tick attached to my leg! Its deep reddish brown body was engorged with my blood. The swollen bloodsucker had been feeding for at least 24 hours. It was the size of a small raisin. Adrenalin rushed through my body as I plucked it off and stared in shock and disbelief. Fears of lyme diseased loomed heavily. To add insult to injury I was forced to hold onto the tick because Al wanted to stop the car to release it for fear that if I dropped it in the car, he'd become the next victim. He quickly pulled the car off the highway to the nearest strip mall parking lot. Within seconds, in a blur of activity the passenger door was opened and a stealthy hand reached over and quickly flicked the tick from my unsuspecting hand and into the parking lot. The tick was gone- no where to be seen as it blended with the black pavement. I was upset as I had wanted to keep the specimen to have it tested for lyme disease. I went about life as usual. 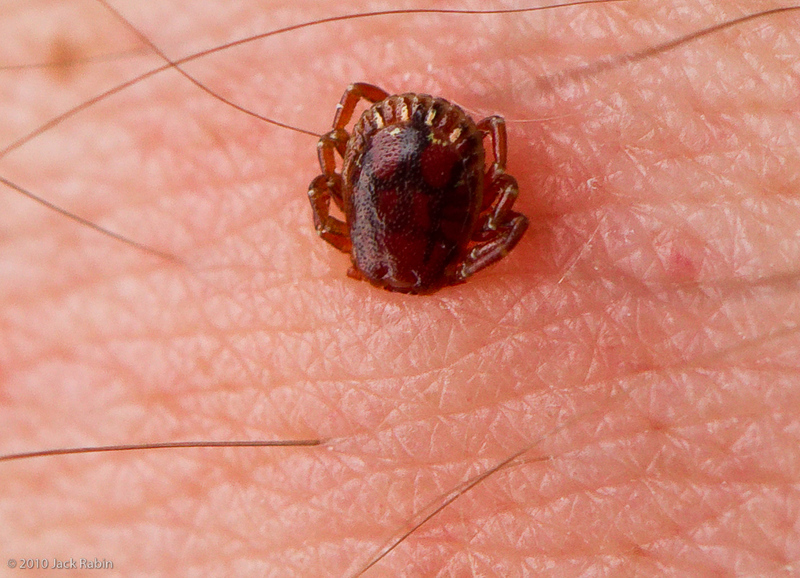 This tick incident occurred in the aftermath of a late term pregnancy loss and in the context of some physical problems I was experiencing for an unknown period of time. Coincidently, my symptoms progressed: extreme fatigue, chills, bloating and weight gain as well as intestinal disturbances. Along with these distressing physical feelings, I just had a generally gloomy and depressed outlook. I was prone to mood disturbances and lethargy. Finally I found myself completely bedridden. I felt as I was living with a looming fog- mentally and physically. I assumed I had contracted lyme disease from the tick and that was the cause of the fatigue. As far as the weight gain, bloating and depression- I just figured it was hormonal imbalances in the aftermath of my loss. The abdominal and intestine disturbances were common symptoms for colon cancer- but I just dismissed that worry as being overly paranoid. The depression and mood problems- I was told was depression- which was to be expected for what I had experienced. After a few days of physically being unable to get up from the couch I decided to make an appointment with the doctor to look into the possibility of lyme disease. I was convinced I had it. I went to a doctor named Debbie*, who worked in the same office complex at work and shared my suspicion with her. She was doubtful of my conclusion, nevertheless took my symptom of fatigue very seriously and apparently tested me for a number of conditions that I didn't know about. From her medical detective work, I learned that I had an undiagnosed thyroid condition and I was on the brink of thyroid failure. My underactive thyroid was responsible for the fatigue, and also other seemingly unrelated symptoms such as weight gain, chills, depression, digestive issues and mood swings. I was also told that untreated thyroid problems could possibly cause pregnancy loss and stillbirth- a possible cause of my late term loss. This problem was discovered at the perfect time as I was once again about 6 weeks into a new pregnancy. Without quick treatment I would have gone on to lose my new baby. I think back to how God intervened at one of the most difficult times of my life, and helped me with an undiagnosed thyroid condition by an unexpected means. I cannot say with any certainty how long I had my thyroid condition. But it is more than likely, if left undetected and untreated it would have caused another pregnancy loss or stillbirth. With perfect divine timing, God intervened with a tick and saved me and my new baby Angelina born February 1, 2013. Debbie Quintana PA works at Fischer Family Medicine. Without her investigative care I would have certainly lost my unborn baby. I truly believed I had Lyme disease. Although lab tests were negative for Lyme disease, unknown to me Debbie tested for other conditions based on the seemingly unrelated symptoms I shared.